This pool on Clearlake Circle was originally built by Fountainhead in 1979 with white plaster, brick coping and Cool Deck. After a number of years, the owners wanted to change the look of the pool. They chose to remove the Cool Deck and replaced it with a Slate Deck. This pool on Lovers Lane was originally built by Fountainhead in 1968 with standard Cast Stone coping and broom finish concrete decks. It also included an open spa area with "floating" sandstone boulders and a large loveseat. In 1985, the owners wanted to reduce the size of the pool, reconfigure the pool seating and deck areas and change the decking material. They converted the large love seat into a rock waterfall, enclosed the spa, removed the "floating" boulders, added stone coping, changed the decks to an aggregate finish and re-plastered the pool and spa using two shades of grey-green dye. This pool on Falls Rd. was originally a green plaster, lap pool with brick coping, aggregate decks with brick insets, a diving board and a child safety fence. In 2000 the home owner asked Fountainhead to freshen up the look of the pool and to replace the decks and patios which had shifted. Given the age of the children, the child safety fence was removed and the shallow-end steps were reconfigured to include a tanning bench. The brick insets were removed and the decks and patios were replaced with new aggregate. The diving board was removed and the interior finish was changed to a medium grey dye complemented with stone coping and boulders. 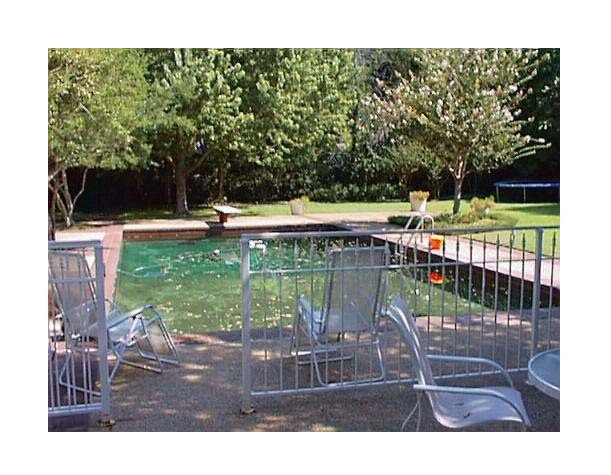 This pool on Turtle Creek Dr. was originally a retangular lap pool with a half circle spa on the residence end. It had brick coping and native pea gravel aggregate decks. 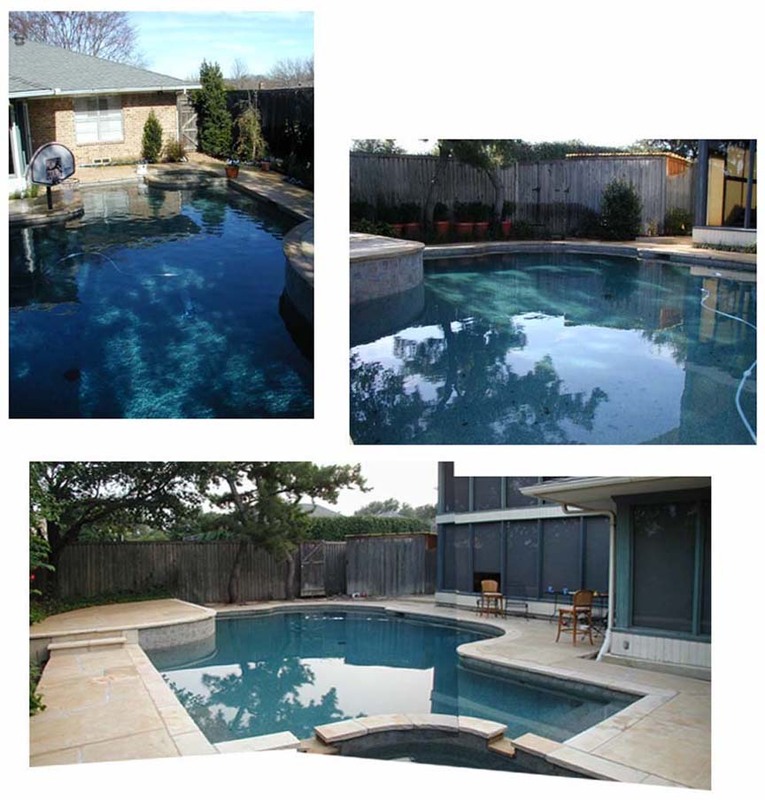 When it was remodeled by Fountainhead in 1995, the homeowner wanted the pool to have a more natural look and chose to change the shape of the pool slightly, as well as, the interior finish, coping and decks. The interior finish is black Pebble-Tec, stone coping, boulders and a rock waterfall were added to give the pool a more natural feel. 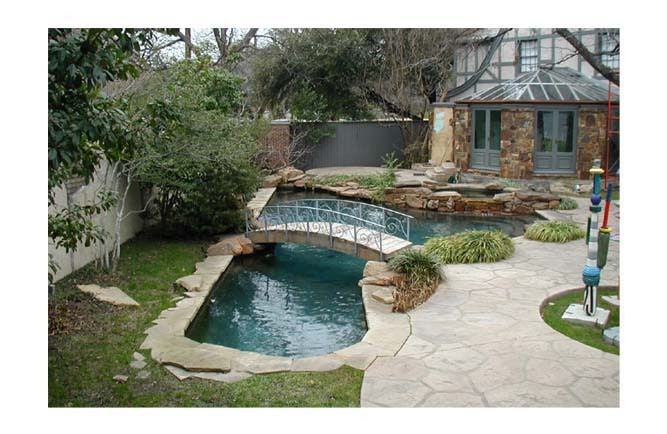 A small footbridge further enhances the natural stream effect of the pool. This pool in Lakewood has a raised patio area at the far end of the pool and a spa at pool level near the house. It had brick coping and native pea gravel aggregate decks. 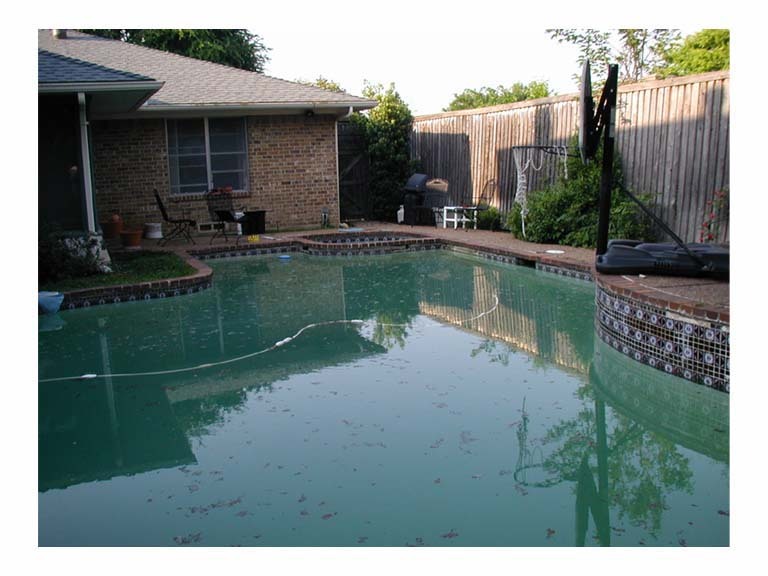 In 2002, the homeowner wanted the pool to have a softer look and chose to change walkway appearance as well as the interior finish, tile and coping. The interior finish is Tahoe Blue Pebble-Tec, with Arizona Rust stone coping, and an artificial slate tile give the pool a softer, more natural feel. After adding about 400 sf of walkways the entire pool deck was re-surfaced using Elite-Crete to complement the new Arizona stone coping.